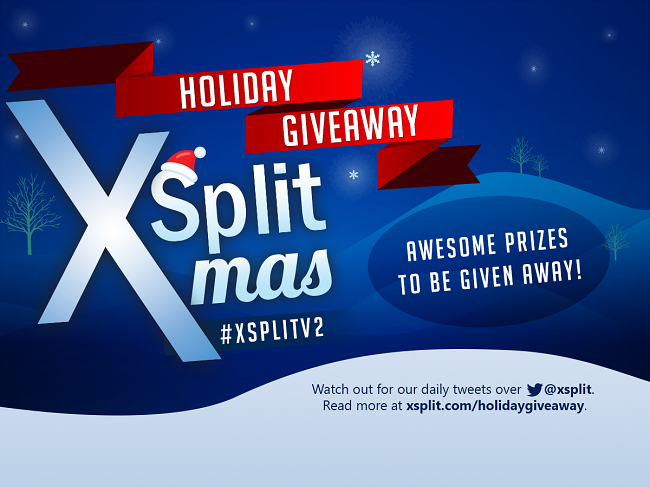 It's the season of giving and we here at XSplit are not new to the idea of giving back to the community. Through the years, we have always been doing something for the holiday season. We've done irresistible product sales since our product went out of Beta in 2012 and we're also quite known for timely and exciting product updates during the same period (like XSplit V2!). This is one of the easiest giveaways that you'll ever join. All you need to do is follow us on Twitter & Facebook, then wait for a tweet from us each day starting December 27 2014 UTC. The tweet will contain a graphic that has the giveaway prize plus requirements on how to enter and win. Winners will be picked the same day at around 9-11 pm UTC. Finally, the number of winners to be picked may vary per giveaway. What about the prizes you might be asking? What are the prizes? The exciting part is we have plenty to give away. Just like the length of the giveaway, we don't want to disclose the prizes here. Following us closely on our social media channels will ensure that you're up-to-date in this regard. As we draw winners during the same day of the giveaway, we will be communicating with them through Twitter DM so it's crucial that you are following us or else we won't be able to DM you (Twitter won't allow us) and we will have to pick another winner.